We are among the leading Importers and of various Temperature Sensors like Thermocouple Sensors, RTDs etc. We also provide NABL Traceable Calibration Report. We manufacture and submit sensor to EQDC for the requirement of NABL accredited lab report at Gandhinagar Lab. We also serve Thermocouple Temperature Sensors and High Temperature Thermocouple Sensors at competitive prices. We also supply Thermowells, Connectors for thermocouples, RTD Extension leads, Compensating cables, and Din Rail / Head mounted RTD/Thermocouple Transmitter. 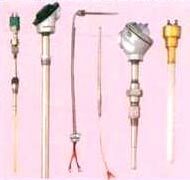 We manufacture all kind of Temperature sensors like Thermocouples, RTDs. Testing of our supply in our lab and we provide NABL Traceable Calibration Report. For requirement of NABL accredited lab report we manufacture & submit sensor to EQDC. Thermowells, Connectors for thermocouples, Compensating cables, RTD Extension leads. Din Rail / Head mounted RTD/Thermocouple Transmitter also we supply. © Copyright 2009 - 2010. ADINATH CONTROLS PVT. LTD.